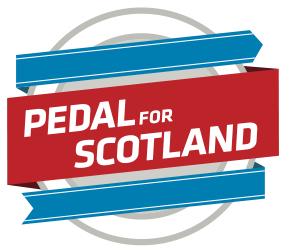 What is Pedal for Scotland? Pedal for Scotland, organised by Cycling Scotland, is Scotland’s biggest bike event. Back in 1999, the first event attracted 400 riders. The event has grown increasingly popular with more routes, bigger challenges and more and more participants joining in year on year. Pedal for Scotland returns for our 20th anniversary event on 8 September 2019, with rides to choose from that cater for all ages and abilities. The main event day will feature the iconic 45 mile Classic Challenge from Glasgow to Edinburgh, the colossal 100 mile Big Belter from Glasgow to Edinburgh and a 10 mile, family-friendly, Wee Jaunt Edinburgh from Linlithgow to Edinburgh. This year we've teamed up with British Heart Foundation, SAMH, Glasgow Children's Hospital Charity and STV Appeal to get more people cycling while supporting good causes. We encourage everyone to fundraise for those organisation when taking part in the event or donate during registration.